On arrival in Lombok with my navigator’s hat on I roughly planned a route from Bali to Nongsa Point on Batam, our planned departure port for Singapore; almost a thousand nautical miles amongst as many islands. There are a couple of “open” stretches of sea but even they are strewn with things to avoid like wrecks, uncharted shallows and oilfields and dire warnings that these waters are WWII minefields. A few days in Medana Bay decided us that we wouldn’t bother with the tourist haven of Bali, we’d enjoyed enough temples, weaving cooperatives and furniture carvers to last months in just one day trip around Lombok. The outline for the rest of our Indonesian cruising therefore may be; Lombok towards Bawean skirting past the eastern end of Java, around 200nm, onto the shallows around Belitung a further 350 nm north west. 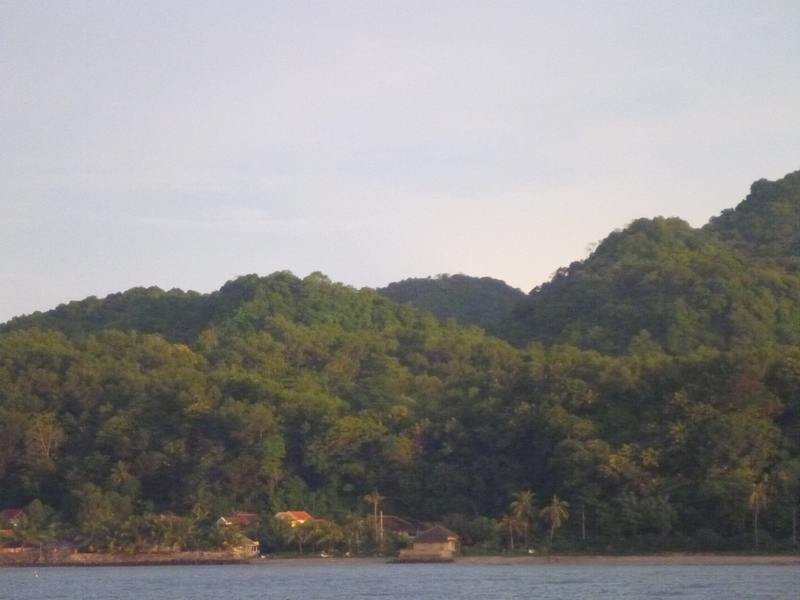 Then another 200nm towards Pulau Linnga, the southern end of which is just twenty miles south of the Equator. Four miles north of the Equator Temptress will enter the waters around the Riau Islands, familiar to her crew from our trips aboard SDF from Singapore last year and we’ll be almost there! The island hopping is essential for fuel supplies as at this time of the year in the transition between the two monsoon seasons sailing winds will be in short supply. 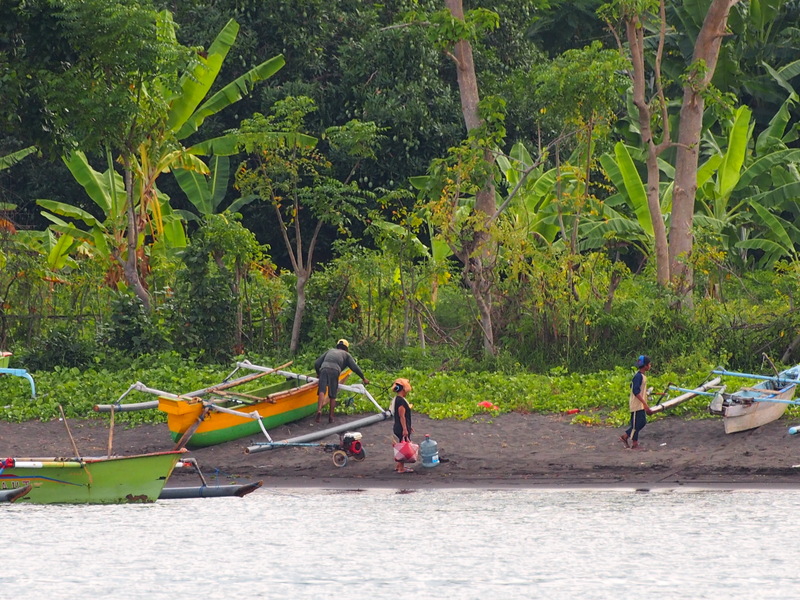 We departed Lombok at midday Tuesday. What followed was a busy afternoon and night at sea for the watchkeeper motoring in a midst of lots of randomly routed shipping and our first oil installation of the trip. Plus a mystery object that the morning revealed to be a rig with red lights atop each of three legs, moving just slightly faster ahead of us. It kept us guessing all night as to what would have three red lights high above a mass of deck lights. Everywhere there was lightening in the sky but no downpour came close, nor was there any wind. We’d managed just 90 minutes sailing so far – in the wind acceleration zone between Lombok and Bali. On Wednesday as Temptress passed between Pulau (P) Kamudi and Karang Takat we finally found ourselves in the midst of a downpour. 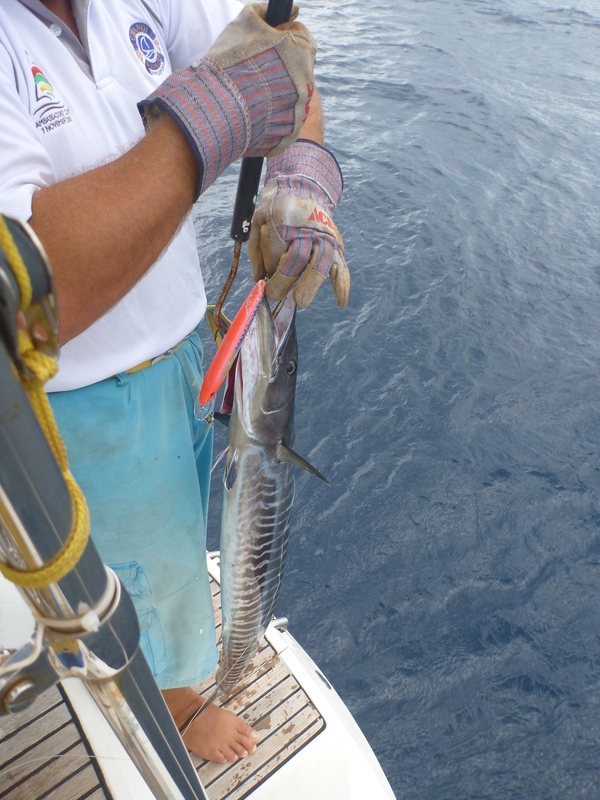 Fortunately it happened after we’d processed into the tiny freezer box eight meals for two from our first fishy catch since the passage to Kupang from Darwin – another large wahoo. A welcome supplement to our dwindling fresh supplies. The skipper striped off for a shower to rinse off the fishyness whilst the thunder rumbled around but discovered the rain didn’t really rinse off the soap too well. However morning coffee proved that fancy biscuits are best off kept in the fridge in the tropics – the filling is crunchy rather than acting as a slippery lubricant for the two biscuit halves – much less messy! P Kamudi is one of a group of islands off the eastern end of Madura which in turn is off the north east corner of Java over one hundred and twenty nautical miles west of Kamudi. The scale of this country is even by our experience of the Pacific island countries immense and it never ceases to impress. From here to Bawean it is over a day’s motoring for Temptress with Java to the south and Kalimantan the Indonesian part of the island of Borneo to the north. Most of Wednesday was spent motoring into a horrid short chop that stopped the boat dead every so often, jerking boat and crew around uncomfortably. From just before lunch until almost supper time it rained alternating light showers with heavy downpours. The first mate also tried showering off on the side deck but it was a nasty experience with stinging raindrops and shampoo running into the eyes; eventually I sought refuge in the aft head to rinse off completely but as a silver lining my hair and skin did feel silky soft afterwards. As night fell the lights came on, just how many fishing boats are there in the Java sea? They were scattered like stars as far as we could see in every direction with the loom of more lights reflecting off the clouds at the horizon. It was possible to count dozens without turning your head. Mostly during the night they moved out of our way as we approached. By ten in the evening there was sufficient breeze from the south west to sail and soon Temptress was racing along at six or seven knots with the second reef in and a partially furled jib. At dawn though the wind as the skipper had predicted before he went off watch at 4am began to die. An hour or so later as we were overtaking a large boxy wooden, blue painted fishing boat hauling nets off to starboard, the wind died to nothing. I furled up the jib and turned the key to start the engine – nothing. I tried again, silence. With visions of us drifting into the large fishing boat some two hundred metres away it was time to wake the Chief Engineer – “Kevin” I yelled. He came on deck and after getting me to try turning the key again with all the batteries connected together to boost the starter battery, unfurled the jib in a vain effort to gain some motion through the water in just a couple of knots of breeze. I turned the boat around so we were drifting away from the net whilst Kevin took a torch and a screwdriver to the culprit – a loose wire to the starter motor, its happened before. This time the engine sprang to life. We furled the jib again and resumed our course of 305 degrees towards Bawean Island. Off to starboard the net stretched as far as the eye could see. As it was roughly parallel to our course I idly noted the log as we set off again. Three to four nautical miles and several marker flags further on Temptress passed what we think was the end of the net or at least we couldn’t spot any more floats in the swell! Sieving the sea seems to be an Indonesian passion, I just wonder who benefits and whether there will be any fish stocks left for future generations. If we’d become tangled up in one of these unlit leviathans in the dark it could have been nasty. 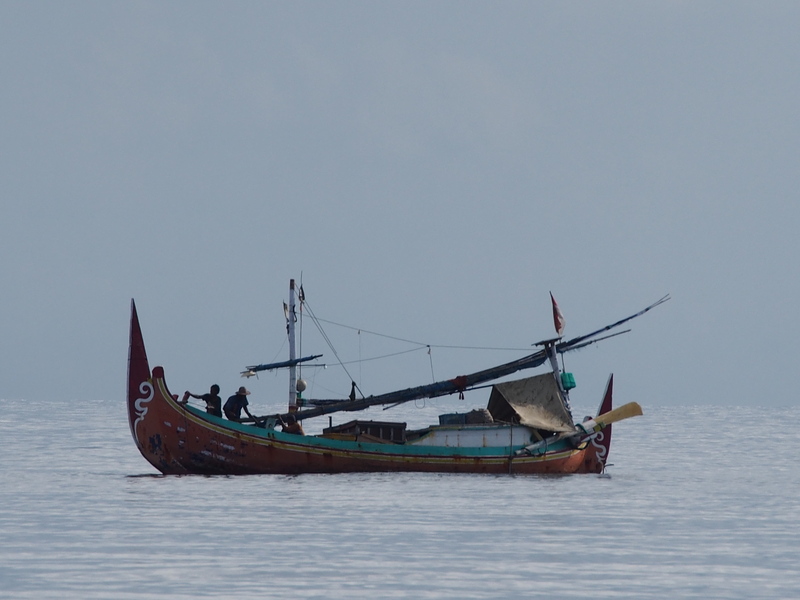 Bawean was approached in another torrential downpour so thick we scarcely spotted a local fisherman in his small boat hauling in a line catch, not that he saw us either. We missed each other by metres. Once at anchor in four metres in the bay the last of the day’s sun came out. It was a pretty place with trees and palms reaching down to the shore and a scattering of red roofed buildings amongst the trees indicating it might be a little less impoverished than some Indonesian islands we’ve visited. A local came by in his boat “what want?”, “solas” came the skippers response but the man moved off either he hadn’t heard or he couldn’t fulfill our request for diesel fuel. The anchorage was rather rolly with a swell from the north despite the reef stretching out from the eastern point but we slept well and in the morning (Friday 11 Nov apparently, we guessed which day of the week based on the lengthy calls to prayer at dawn). Having topped up the fuel tank with 100 litres from the cans on deck we decided to head north west again towards Belitung. If we can sail for another eight or nine hours there will be no fuel crisis aboard. PS: will add photos when we’ve a better internet connection!